A festival pass runs $75 while single program tickets are $10 for the general public.2 You can view the entire schedule for the Secret Theater here. 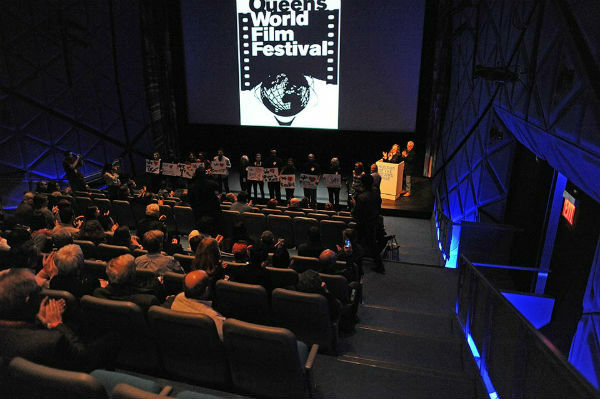 The fourth Annual Queens World Film Festival (“QWFF”) is thrilled to return to the most diverse community on the planet on March 4-9, 2014 with a riveting program of feature films and shorts. The Festival is set to open at the prestigious Museum of the Moving Image on March 4th and will roll out to the Secret Theatre in LIC, the Nesva Hotel also in LIC and the historic PS 69 in Jackson Heights. Sponsored by Investor’s Bank of New Jersey, Kaufman Astoria Studios, Queens Courier, Manhattan Portage and with a grant from Queens Council on the Arts, QWFF 4 is now a Queens Institution and gaining traction as a MUST on the Indie Film Festival Circuit. In addition to integrating the work of 18 local Queens Filmmakers, The Festival is spotlighting a dazzling selection of foreign films from around the world including Belgium, Iran, India, Spain, Kosovo, Switzerland, Vietnam, the UK and Canada in an exciting roster spread out over 5 days. QWFF is excited to announce a one night only screening and the World Premier of the Director’s Cut of the of 2014 Academy Award Nominated Documentary “THE ACT OF KILLING”. Directed by UK Filmmaker Joshua Oppenheimer, the doc portrays the story of national guilt potentially exhumed by a love of movies. QWFF is thrilled to announce the 2014 QWFF Spirit of Queens Recipients: independent film icon Hal Hartly and Executive Director of MoMI Carl Goodman. This honor, which recognizes one extraordinary artist and one outstanding citizen who embody the spirit of our borough, is poised to become a hallmark of the annual film festival. Hartley has worked beyond the Hollywood establishment for over 20 years. His offbeat, quirky pictures of the road less traveled are a direct line to the heart of our borough. Goodman has steered MoMI back onto its rightful path as a Queens Institution and world class screening facility and has put the museum back onto the forefront of the indie film circuit. Our festival is once again programmed into thematic BLOCKS, grouping like minded films together so that audiences may get the full impact of what the festival has to offer. Go to the website, sort the films by film, by country, by genre or by block and purchase a very affordable ticket.